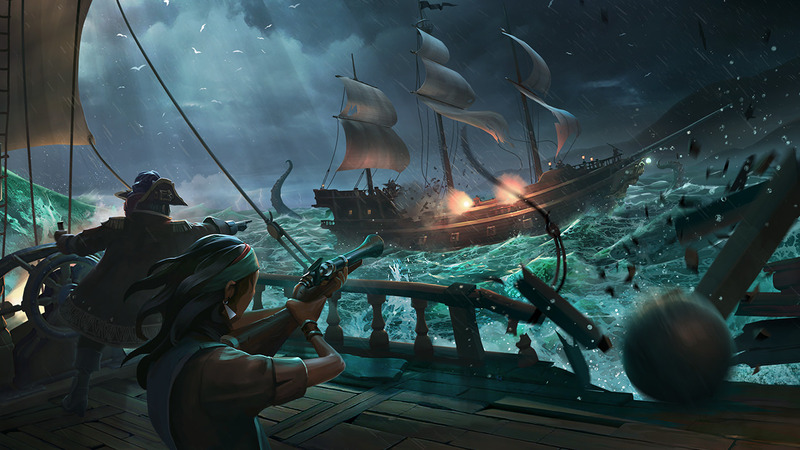 The recent Sea of Thieves beta which took place between the end of January and the beginning of February turned out to be a resounding success for Rare, particularly on live streaming platforms like Twitch where the game dethroned the likes of PUBG and Dota 2 for about a week. It’s a very watchable and shareable game. We’ve seen from our beta that people watching other people play has driven them to come into the game. It’s driven pre-orders during that time period. Watching people play and seeing their adventures and going, oh, what could I do, sparks your creativity and imagination and makes you want to come into this. And because it’s a fun and welcoming game, you’re not watching a super competitive game, which is great to watch but then going, I’m not going to be able to do that. Instead, you’re watching it and going, oh that was really funny, or, I wouldn’t have imagined using the explosive barrel in that way, or firing myself out of the cannon into someone crow’s nest. You start going, oh, what can I do in that game? You see a real conversion of people who want to then come in and try stuff. There are so many reasons why I have such confidence in the appeal of Sea of Thieves. Strategically we’ve made some really good decisions around the type of game we’re making and how we’re bringing it to market. For me, it’s about the scale of the opportunity and making the most of the opportunity. That’s the pressure I feel. It’s like making the most of the opportunity. Rare hosted another Sea of Thieves beta scale test over the weekend and there will probably be another one ahead of the March 20th launch. Are you planning to purchase the game? If so, you can pre-order from the Store and get a Black Dog outfit, cutlass and matching musical instruments.